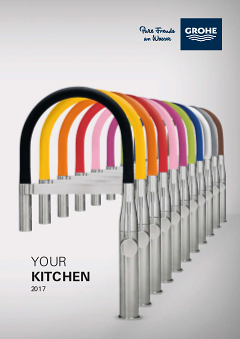 The GROHE K7 FootControl kitchen tap – professional performance and style at an amazing price! The innovative GROHE K7 FootControl kitchen tap makes it easier than ever to fill big pots and clean down the basin and work surface. With a medium high spout that swivels through 140° and a pull-out Professional Spray that turns through a full 360°, it has a seriously long reach and cleaning power. You can even switch between a fine spray and a powerful jet with a push of a button. And now it has our innovative FootControl technology so you can turn the water on and off with a simple tap of your feet on the base unit – perfect for when you are cleaning dishes, washing your hands or lifting heavy pans. It’s a pleasure to use, too, as the GROHE SilkMove ceramic cartridges ensure controlling the flow and temperature of water is effortless and precise. With an easy installation system means you can fit it in no time. The GROHE K7 FootControl kitchen tap – where professional level performance meets cool and contemporary kitchen style. It’s time to master your kitchen like a professional chef! GROHE FootControl taps can be turned on with a simple tap of your toe on the base unit to leave your hands free and your tap spotless. This new level of kitchen convenience makes it easier than ever to fill heavy pots and clean the dishes or your hands while also leaving the tap hygienic and germ-free.